Pegasystems Inc. (NASDAQ: PEGA) is the leader in software for customer engagement and operational excellence. Pega's award-winning capabilities in CRM and digital process automation (DPA) power digital transformations at the world’s leading enterprises. Founded in 1983 and headquartered in Cambridge, Massachusetts, Pega has over 4,500 employees across North America, Europe, Latin America, and Asia. In 2018, Pega was ready to fully migrate www.pega.com to Drupal 8 and take advantage of Drupal’s best in class editorial tooling and modern architecture to empower Pega’s content creators and marketing teams to deliver engaging content experiences at the speed and cadence needed to compete in today’s digital space. Pega.com was recognized as a 2018 Engage Award finalist for "Excellence in Digital Marketing." The new Drupal 8 site drove a record number of attendees to the PegaWorld annual conference in June 2018. The digital experience Pega is envisioning and building allows us to set the terms for how world-class B2B websites should function. With Acquia as a technical partner and Mediacurrent as a development partner, we are fully enabled to deliver digital experiences that meet the core needs of our global audiences. Our foundation in Drupal 8 empowers our team to execute on the vision we have while delivering key outcomes for the business. For Pega’s Digital teams, the migration to D8 offered a more adaptable platform with faster cycle times for B2B content publishing and the ability to reach a wider audience with engaging, high-value Digital experiences. Layers of architecture build-up from previous rounds of development and an elaborate implementation of Bean slowed the pace of innovation on Pega’s complex Drupal 7 site. Stretched to its limit, the D7 environment wasn’t meeting the company’s needs for handling a high volume of content in multiple languages. Plus, a number of proprietary integrations had to be accounted for — a challenge that only an experienced Drupal 8 development team could solve. Pega looked to Mediacurrent for guidance, leveraging our deep experience in Drupal 8, specifically around i18n, component and paragraphs-based architecture, to make sure their Drupal 8 project was delivered with the right foundation and in time for their largest conference, PegaWorld, in June 2018. Experience pioneering the initial Drupal adoption. Deep experience in Drupal i18n and Paragraphs implementations. Acquia preferred partner team and Acquia certified Drupal 8 developers. To generate Digital engagement with Pega’s content, the marketing department needed an ambitious website aligned with Pega’s brand identity. Mediacurrent upheld Pega’s philosophy of build for change, architecting a Drupal 8 platform that’s made to be measured, optimized, and evolved. An internationalization and Paragraphs-based Drupal 8 architecture are the groundwork for the new Digital experience. Built to adapt, the new system gave Pega the flexibility to fine tune requirements throughout the migration. By running the former Drupal 7 and new Drupal 8 sites in parallel, we were able to move site elements over in stages to allow for continuous improvement. Taking an iterative approach to re-platforming onto Drupal 8 guaranteed that tight launch deadlines were met. The flexibility for the marketing team to create customizable campaign landing pages and Acquia’s hosting support to scale soaring traffic volumes during the PegaWorld 2018 site launch has resulted in a fully re-designed and highest performing www.pega.com site experience yet. Explore how Pega.com personalizes the customer experience in this pre-recorded webinar led by the Senior Director of Web Architecture at Pegasystems. Custom layouts with Paragraphs allow the marketing team to express their vision within brand guidelines and without developer support. Now, Pega.com puts editors and marketers in direct control of what goes on the page, with many variations for styling and display. Pega developed the Open Source Bolt Design System to give the team a more stable way to design and develop faster — and stay on brand. Mediacurrent helped to integrate Bolt with Drupal 8, ensuring that the implementation architecture would work correctly with their translation needs and would be extendable in the future. A pioneering internationalization strategy detects preferred browser language: When a user visits the page that detects browser language, the system will prompt them if it doesn’t match the page they are viewing, presenting the option to switch to the correct language. To aid in compliance with the General Data Protection Regulation (GDPR) a language-personalized popup message informs European Union site visitors. Regional content appeals to an international audience. A clear website taxonomy system and metadata are the basis for www.Pega.com’s SEO strategy — one that increases visitors, decreases bounce rates, and ultimately provides more relevant content to each of Pega’s constituent audiences. Our focus was to build bespoke solutions to drive brand messaging and personalized content on Pega.com. Long blocks of content transformed to become short and ‘snackable.’ Every piece of content is designed to answer a customer question in the sales journey. The Mediacurrent team built an integration with LinkedIn to build visitor profiles and an integration with Pega’s Enterprise Content Manager that serves as a source for marketing collateral and a controlled vocabulary store. To pre-fill webforms, an integration with the Pega Marketing Lead Marketing Management System (LMMS) serves to identify user IP address and source identifying information including company, location, name, and email. 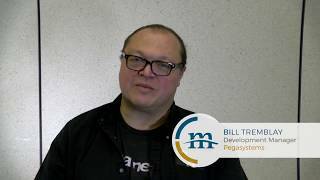 In his own words, Pegasystems Development Manager Bill Tremblay shares the technical advantages of Drupal 8 and his team's experience working with Mediacurrent. Search API/Search API solr/Facet - Many pages on pega.com are facetable fulltext-searchable listings. Mediacurrent developed a reusable theme framework for building these types of pages. Paragraphs - Pega’s development team and Mediacurrent collaborated to develop a highly abstract set of paragraph types that integrated design elements from Pega’s Bolt design system. Webforms - Using Webform module’s “handler” framework, Pega and Mediacurrent collaborated to implement extensive personalization for visitors viewing webforms. Lingotek - Mediacurrent developed UX improvements for the Lingotek admin UI to fit Pega’s needs. We contributed a number of patches. After successfully migrating Pega.com to Drupal 8, and working closely to implement Bolt’s vision on the new site, Mediacurrent and Pega are now working together toward future improvements for the platform. Enhancing translation management tools will empower editors to create, translate, and test content at the speed needed to meet Pega’s business objectives.